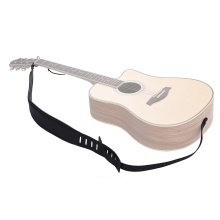 Shoulder strap for acoustic/ electric guitars and bass. 8cm/ 3.1in super-wide design, more comfortable to use. Adjustable usage length, and max. length is up to 147cm/ 57.9in, suitable for different persons. High-quality PU leather belt with Neil Zaza signature, plus thickened design, durable and comfortable. An ideal replacement for your old guitar/ bass strap. The guitar showed in the picture is not included.